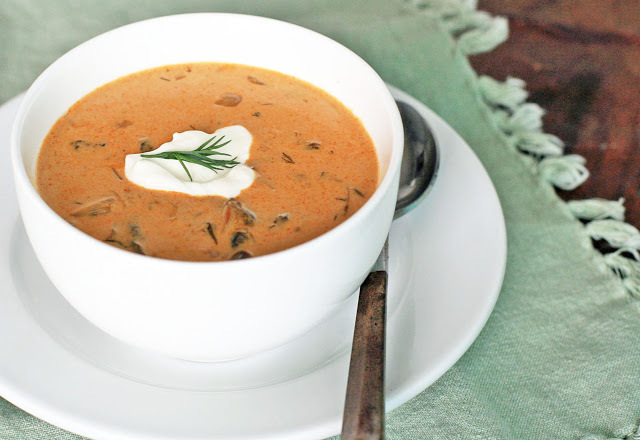 This Hungarian mushroom soup is smoky, creamy and, oddly enough, meaty; even though the soup is vegetarian the mushrooms add a definite meatiness to the soup. Although you start with a whole pound of mushrooms, they cook down a significant amount so if you’d like plenty of leftovers I suggest doubling the recipe. 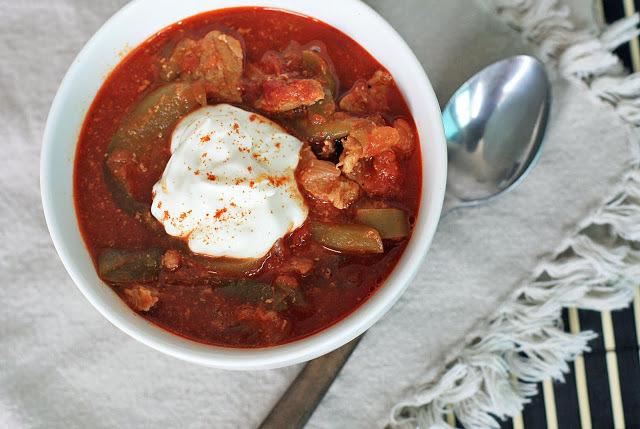 When I was reading about Hungarian food online, people stressed again and again how much better Hungarian paprika is than the standard stuff you’d find in your supermarket spice aisle. Unfortunately I wasn’t able to find any, but the soup was great even without it. I also recommend adding a bit of smoked paprika if you have it on hand; it definitely added another level of flavor. If you’d like to add some heat, add cayenne to taste. In a large saucepan, melt the butter over medium heat. Add the onions and cook until the onions begin to brown. Add the mushrooms, dill and paprika. Stir well, cover, and cook for about 10 minutes, stirring occasionally. Add the lemon juice and mix well. Add the broth, cover and cook for another 10 minutes. Reduce the heat to low. Add the milk and stir well. 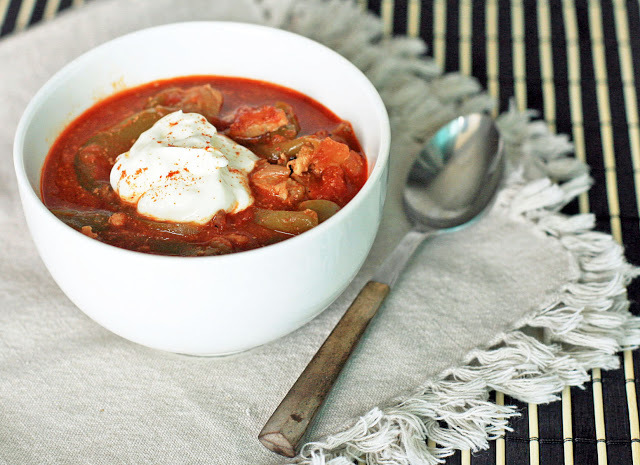 Whisk in the sour cream and heat gently until soup is hot. Make a cornstarch slurry with the cornstarch and water, making sure there are no lumps. Add to the soup and stir well. Continue to cook over low heat for a couple minutes, until the soup has thickened slightly. Salt and pepper to taste. Pour into individual bowls and garnish with a dollop of sour cream and a sprinkle of fresh dill, if desired. Oh, how I love finding naturally gluten-free breads and desserts from these countries I’m visiting. The recipes are special namely for what they don’t have, like a long list of ingredients like xanthan gum or egg replacer. They make life so much easier for me, and I imagine, you too. 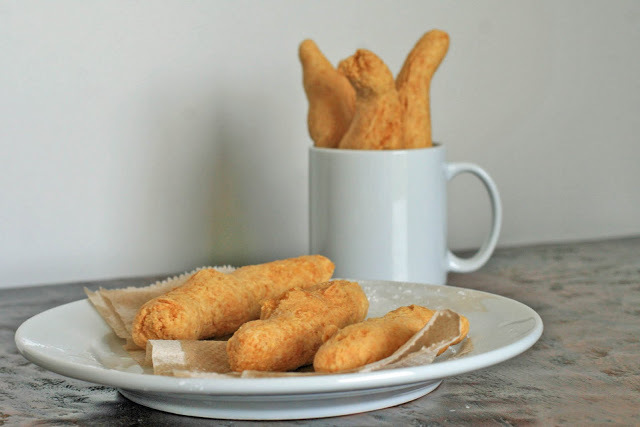 Even if you’re not gluten-free yourself, I’m guessing you probably know somebody who is. And I know having them over for meals can be, well, a little bit tricky. I actually feel guilty when a dinner host has to make special accommodations for me or run to the health food store to buy special ingredients. That’s where foods like rotti can save the day. 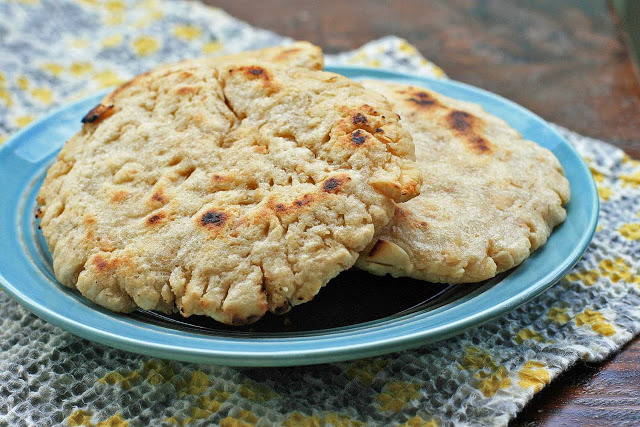 Rottis are a pan-fried soft bread, similar to Indian nan, that are made with toasted rice flour. Even with some coconut thrown into the mix, I found them super versatile. I ate them alone with a smidgen of butter, dipped them into extra curry sauce, used one to make an open-faced sandwich. All great options. The best part about this recipe? It has only four ingredients. And two of them are things you without a doubt already have: water and salt. The only thing that makes these slightly time consuming is toasting the rice flour and coconut. But you don’t need any rise time for this bread, so I’d say it all just about evens out. Place the rice flour in a large skillet over medium heat. Stir the flour continuously to ensure even toasting. Remove from heat when the rice flour has darkened several shades and emits a toasted aroma. Place the toasted rice flour in a large bowl. 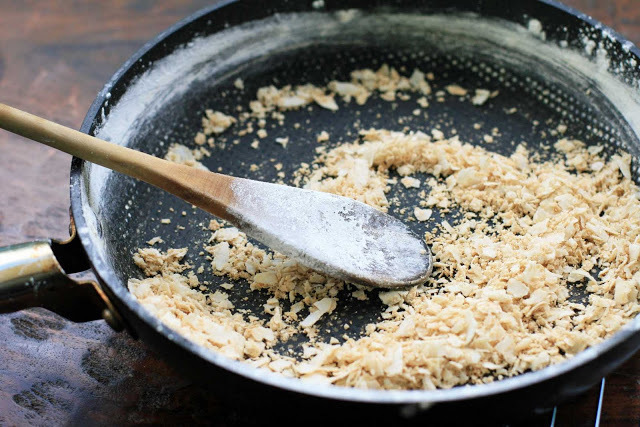 In the same skillet, toast the coconut, stirring constantly, just until it begins to turn golden (note: toasting the coconut second will help unstick any toasted rice flour that’s stuck in the grooves of your pan if you have a textured pan like me). Add the coconut to the rice flour and add salt. Stir to combine. Add just enough water to make a soft dough. Knead it until it forms a ball and no longer sticks to the side of the bowl. To test the moisture level, roll a bit of the dough in your hand and press it flat. It should easily stay in one piece but it should also have some cracking around the edges. If your edges are totally smooth, you’ve added too much water. In this case you can add a bit more un-toasted rice flour to the mixture. Roll the dough into balls about the size of a golf ball. Place each ball between two pieces of waxed paper and use your palm or a rolling pin to flatten to your desired thickness. If you’re a rotti newbie like me you might want to keep them on the thicker side; if you make them too thin, the can break easily. Fry on a preheated, lightly greased griddle or frypan over medium to medium-high heat until it begins to brown, about 4-5 minutes. Flip and cook on the other side until golden. Even if this recipe hadn’t looked very good, I might have made it anyways just because of its name. 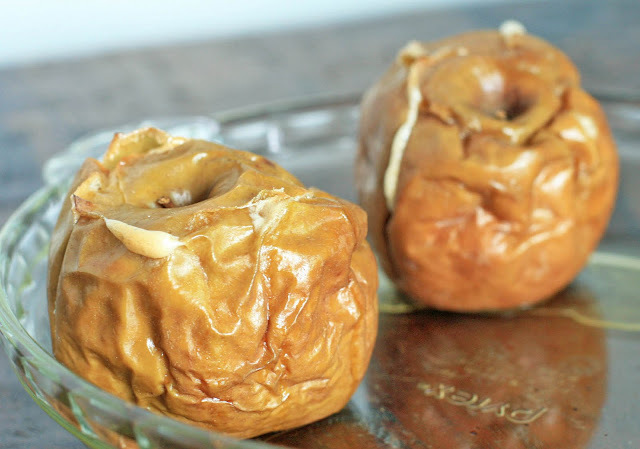 Luckily for me it was a winner: baked apples are pureed and combined with vanilla sugar, egg whites, rum and lemon juice and then whipped until light and frothy. Hungarian food tends to be pretty heavy: lots of pork, veal, sour cream, etc., etc. 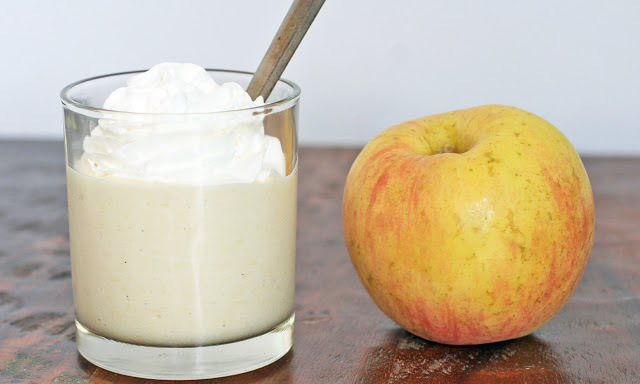 This is a nice and light dessert that shouldn’t contribute too much to any post-meal food coma. One final note: a lot of Hungarian dessert recipes use vanilla sugar. I was too lazy to make some so I cheated by using regular sugar but I substituted homemade rum vanilla extract, which had plenty of vanilla bean seeds, in place of the regular rum. It worked out very well, so feel free to go this route if you have homemade vanilla extract at home. After a number of complicated, multi-step recipes, this veal stew was a total breeze and a welcome change of pace. Nothing complicated or fancy going on here- just a simple combination of veal, vegetables and spices simmered until tender. In fact, the hardest thing about this stew was deciding what to put in it. Some people use green peppers and tomatoes while others omit one or both. I had both on hand so I decided to use them both and it was a nice way to lighten a predominantly meat stew. Serve with rice, noodles, or Hungarian dumplings. Heat the oil in a large saucepan over medium heat. Add the onions and garlic and cook, stirring occasionally, until the onion begins to brown. Add the veal and cook until the meat is browned. Add the bell peppers, paprika and cayenne and stir until combined. Add the pureed tomatoes and just enough beef broth to cover the meat. Reduce the heat to medium low and simmer, partially covered, until the meat is tender, about one hour. Salt and pepper to taste. Place in individual serving bowls and top with sour cream, if desired. Aren’t these pretty? The timing of these was just about perfect because they taste exactly like jelly beans. I kid you not. I think they’d be a perfect light ending to a big Korean meal. I first tried the roots plain. The texture was great and the sweetness was just right, but they didn’t have too much flavor. I much preferred the flavored ones. Ginger would be a great addition but the sky’s really the limit here- just use your favorite extract. If you want to get really fancy, make a few different varieties and use a drop or two food coloring to distinguish them from one another. Put lotus roots in a large bowl and cover with water. Soak for 30 minutes. In a large saucepan, combine 6 cups water, vinegar and pinch salt and bring to a boil. Drain the lotus roots and add to the boiling, acidulated water. Cook gently over medium heat for approximately 10 minutes. Drain and rinse several times under cold water. In the same saucepan, bring the sugar and 3 cups water and bring to a boil. Add the lotus root and simmer, uncovered, over medium-low heat for approximately 30-40 minutes, or until the roots are translucent and have soaked up most of the syrup. Place in a single layer on a cooling rack covered in wax paper. Serve immediately or store in an airtight container and refrigerate. 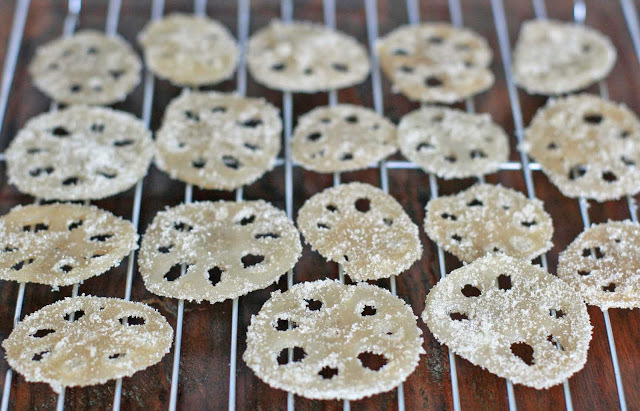 Optional notes: If you’d like the candied to be ginger flavored, add in several slices fresh ginger when you add the lotus roots. If you’d like to use flavor extracts, stir in about 1/2 teaspoon of your chosen extract about five minutes prior to the end of the simmer time. If you’d the candies sugar-coated, let the roots cool slightly after simmering and dip individual roots into a bowl full of sugar. Additional Note: Here’s how to prepare fresh lotus roots if you cannot find them frozen and pre-sliced. 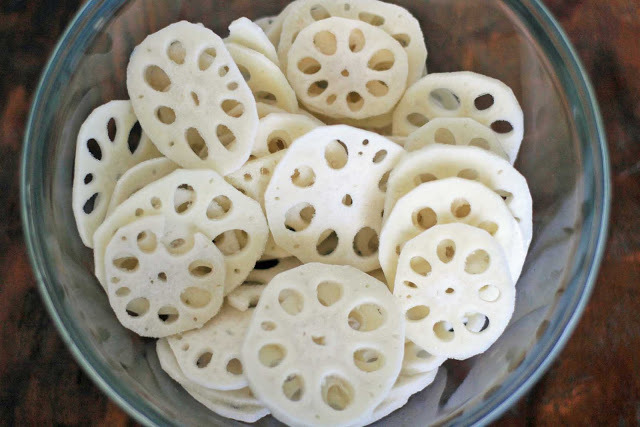 Rinse the lotus root and peel, using a stainless steel peeler, to avoid discoloration. Cut into thin slices, approximately 1/6th to 1/8th of an inch, using a knife or mandoline. Immediately put lotus roots slices into a bowl full of water to prevent the roots from oxidizing and turning brown. 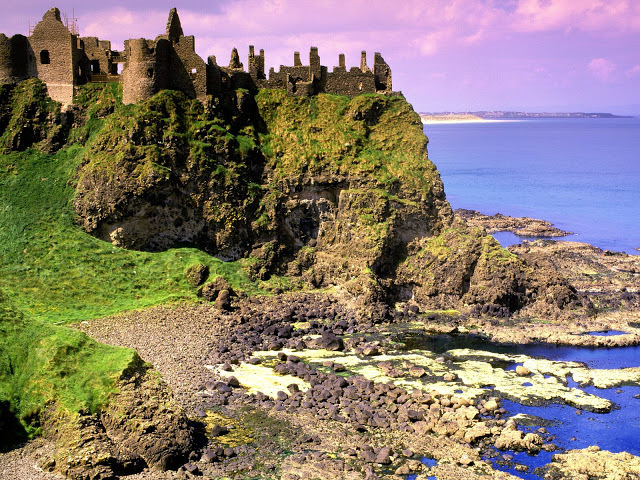 Ireland, it’s time to say goodbye. It’s been great, but really it’s best that I slip away quietly now before I do any more damage. It’s actually hard to grasp the amount of cheese, heavy cream, and booze that I’ve put away in the past two weeks. Of course the bright side is I’ve found some wonderful new recipes, like these rustic potato and oat crepes , this Irish pub pepper soup, this strawberry and oat flummery parfait, and this rhubarb and ginger crumble. What didn’t make the cut? For starters, a pleasant but unexciting cream of cauliflower soup. Pleasant but boring can be a tough sell. There was also what I prematurely envisioned as Ireland’s piece de resistance, Seafood Mornay. 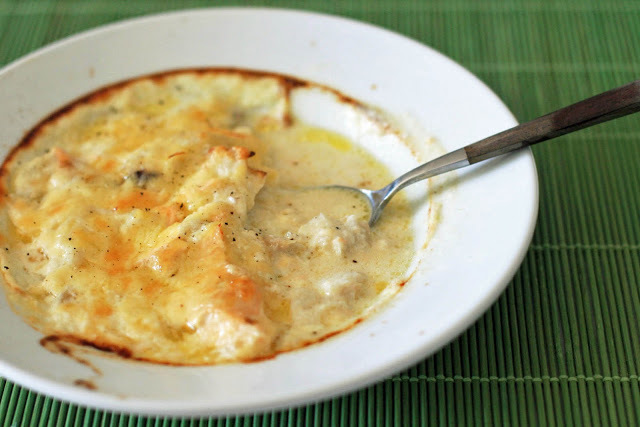 Several kinds of fish poached and then combined in a creamy cheese sauce and baked until browned and bubbly. Looks pretty good, right? I think it was. The problem was one of the fish I used gave me a mild case of food poisoning. Not the recipe’s fault, of course, but I still can’t muster any excitement over the dish anymore. Food poisoning aside, I had a wonderful time visiting the Emerald Isle. I’d love to stay longer (there are so many other recipes I want to try! ), but seriously folks, it’s time for me to step away from the cheese. Next up: a country that uses less dairy. I think it’s for the best. I couldn’t help myself. These are typically rolled into balls for a snack, but their beautiful red hue was practically begging to be made into a heart shape. 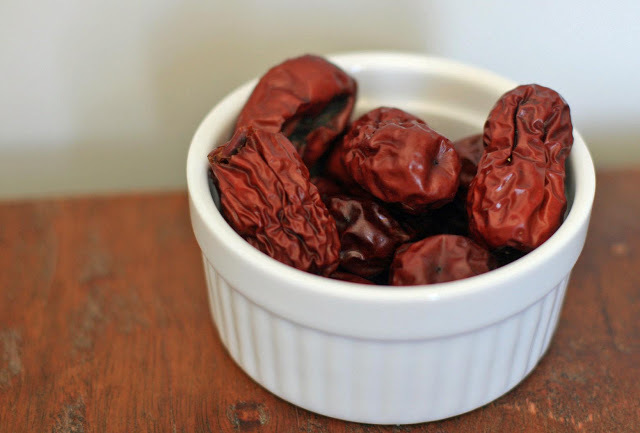 This was my first experience with red dates, or jujubes, but it won’t be my last. They’re typically sold dried and while they’re not good for out of the bag snacking, they do impart a wonderful fruity sweetness to whatever they’re being cooked with. Rice balls are a common snack in a lot of Asian countries, although this has been one of my favorites since the black rice, red dates and walnuts give it some extra heft and chew. It also kept me full a bit longer than the more basic seaweed varieties. I also saw several sweetened versions of this basic recipe for dessert. If you’d like to go that route, I’d suggest either adding up to 1/4 cup of brown sugar to the rice prior to cooking, or cook as written below, and drizzle with maple syrup. Place the black and sticky rice in a sieve and rinse under water. Place in a bowl and cover with water. Let soak for five hours. Drain the rice in a sieve placed over a bowl, reserving the soaking liquid. Place the rice in a rice cooker and add 1 1/3 cups reserved soaking liquid. Add the dates, walnuts, salt and sesame oil. Turn on the rice cooker. When the rice is done cooking, serve immediately or let cool slightly before rolling into rice balls. To make the rice balls, place about 1/2 cup cooked rice mixture and place onto a large piece of plastic wrap. Bring the sides of the plastic wrap up around the rice mixture and twist the ends together in the center to shape into a ball. Note: If you do not have a rice cooker, the rice can be prepared as follows. 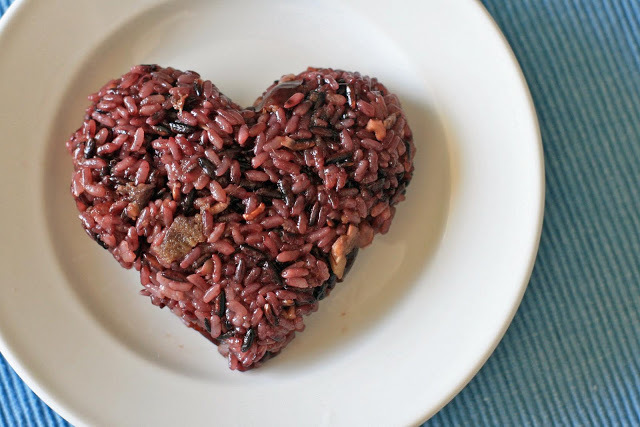 Combine the rice, 1 1/3 cup soaking liquid, dates, walnuts, salt and sesame oil in a heavy bottomed saucepan with a lid. Place the lid slightly askew and bring to a boil over medium heat. Reduce the heat to low, cover tightly and let simmer for 15 minutes, or until the water is completely absorbed. Remove from heat and allow to sit and steam for another 15 minutes. I suppose it would have made the most sense for me to post this at the beginning of my time in Korea, especially since I used cabbage kimchi for the kimchi fried rice. 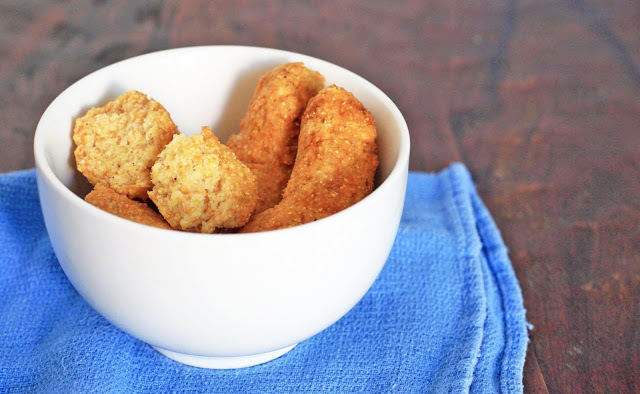 Unfortunately, it took me a long time to create a recipe I thought was blog-worthy. I tried a bunch that were either too salty, too boring, or too fermented. I can find better kimchi than that around here in the refrigerator section of the drug store. I’m hardly a kimchi expert- I’d never had even tried the stuff until a couple years ago. But I like my kimchi to taste fresh while still having the requisite funk. I finally found one that fit the bill- and it doesn’t require much fermentation time. You just soak some chopped cabbage in salt water for a couple hours, drain, mix in a kimchi paste and let sit for another couple hours. That’s it. Easy. The fish sauce and oyster sauce help give this kimchi it’s depth of flavor. Many kimchi recipes don’t use them, but I found they made the kimchi so much more interesting than the recipes that relied on salt only. 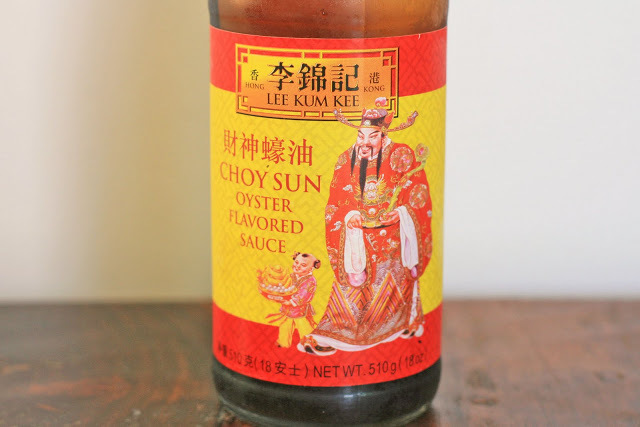 Most fish sauces are gluten-free, but finding gluten-free oyster sauce can be more challenging. Below is the kind that I’ve used for the past couple years in case you’d like a visual to help look at your grocery store. Dissolve the salt into 1 cup of water. Place the cabbage in a large bowl or container and pour the salt water over it. Toss quickly and then let sit, without any additional stirring, for 2 hours. 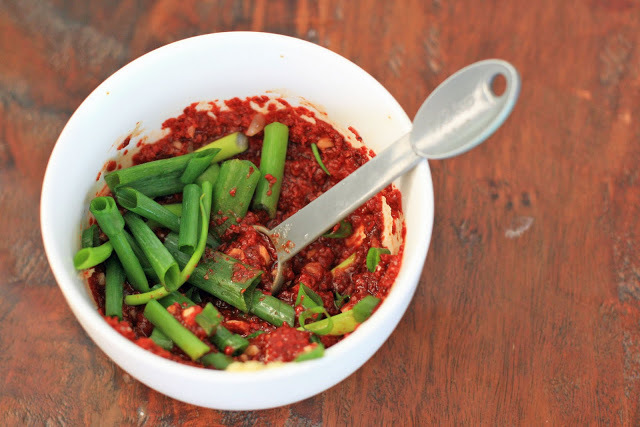 While the cabbage is soaking, make the kimchi paste by combining the red pepper flakes, 2 Tablespoons of water, garlic paste, ginger, sugar, oyster sauce, fish sauce, and green onions. Drain the cabbage in a colander or in a piece of cheesecloth and give the cabbage a quick rinse under cold water. Gently squeeze out any excess liquid. 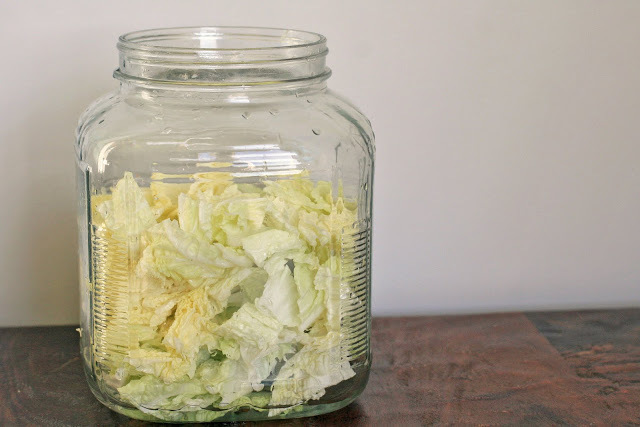 Place the cabbage in a large bowl or jar and stir the kimchi paste into the cabbage. Mix thoroughly to ensure that each piece of cabbage is coated. Let sit at room temperature for 2-3 hours. Cover and refrigerate. Fried rice is pretty much the ultimate quick, healthy and filling meal. Although the healthy part doesn’t necessarily ring true in Hawaii, where most fried rice consists of white rice, Portuguese sausage, bacon, lup chong sausage, and few-if any- vegetables. Absolutely amazing, but healthy it is not. 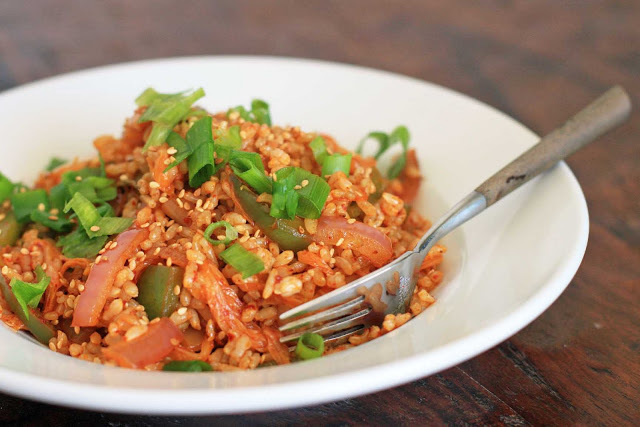 This kimchi fried rice, however, would likely get a nutritionist’s seal of approval with its cabbage kimichi, loaded with vitamins and healthy bacteria, onions, peppers and brown rice. 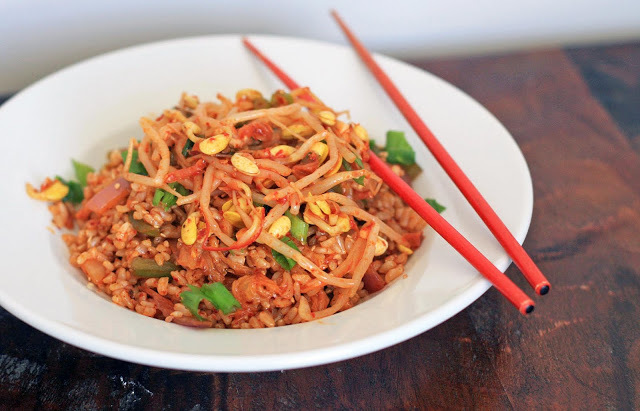 The fried rice is great on its own, but topping with yesterday’s seasoned soybean sprouts adds an extra level of crunchiness, spice and flavor. Want to make it even more filling? Add a fried egg on top. 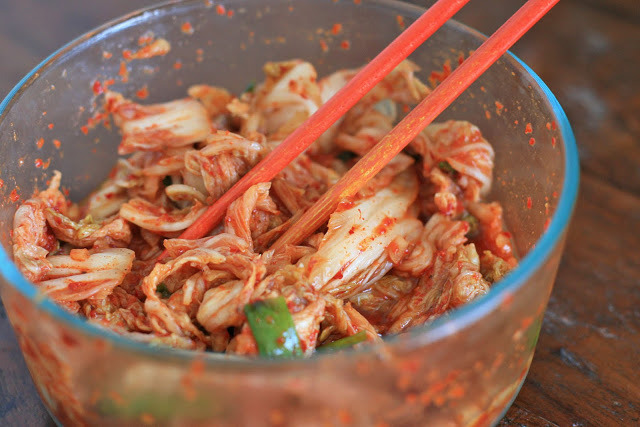 This would also be a great way to introduce kimchi to your less adventurous friends and family. Heat the oil in a large skillet or wok over medium-high heat. Add the chili powder and the kimchi and stir-fry for 2 minutes. Add the bell pepper and onion and continue to cook for another 2-3 minutes, until the pepper and onion begin to soften. Add the rice and mix thoroughly. Add the sesame oil and fish sauce sauce and mix again. Cook for 3-5 minutes until the rice is heated through. Divide the rice into two bowls and sprinkle with the green onion and sesame seeds. Top with seasoned beansprouts, if desired. Some of you might remember that my last attempt at fried cornmeal fritters didn’t go so well. But try, try again I say. Plus, with a name like festival, I had the feeling that these might be just the things to turn my cornmeal fritter luck around. Festival is new but popular addition to the street food scene in Jamaica. I made a half batch to test the waters and knew that I’d be making them again before my two weeks in Jamaica was up. Combine the brown rice flour, tapioca starch, potato starch, cornmeal, sugar, xanthan gum, nutmeg, baking soda, vanilla and salt and mix well. Add just enough milk to form a stiff, workable dough. Roll into cylinders several inches long. Heat oil in a small, heavy-bottomed saucepan to 350 degrees. Drop in the shaped dough and fry for about 4-5 minutes, until outside turns golden and the center of the fritters have cooked through. Drain on paper towels and serve.